Alexander Zemlinsky or Alexander von Zemlinsky, (14 October 1871 ? 15 March 1942) was an Austrian composer, conductor, and teacher. Zemlinsky was born in Vienna and studied the piano from a young age. He played the organ in his synagogue on holidays, and was admitted to the Vienna Conservatory in 1884. He studied piano with Anton Door, winning the school's piano prize in 1890. Zemlinsky also studied composition and began to write music. Zemlinsky was born in Vienna and studied the piano from a young age. He played the organ in his synagogue on holidays, and was admitted to the Vienna Conservatory in 1884. He studied piano with Anton Door, winning the school's piano prize in 1890. Zemlinsky also studied composition and began to write music. Zemlinsky had a valuable supporter in Johannes Brahms; he recommended the younger composer's Clarinet Trio (1896) to the Simrock company for publication. Zemlinsky also met Arnold Sch&ouml;nberg when the latter joined Polyhymnia, an orchestra in which he played cello and helped found in 1895. The two became close friends--and later mutual admirers. Zemlinsky gave Sch?nberg lessons in counterpoint, thus becoming the only formal music teacher Sch?nberg would have. In 1897 Zemlinsky's Symphony No. 2 (chronologically the third he had written, and sometimes numbered as such) was a success when premiered in Vienna. His reputation as a composer was further helped when Gustav Mahler conducted the premiere of his opera Es war einmal at the Hofoper in 1900. In 1899 Zemlinsky secured the post of Kapellmeister at Vienna's Carltheater. In 1900, Zemlinsky met and fell in love with Alma Schindler, one of his composition students. She reciprocated his feelings initially; however, Alma felt a great deal of pressure from close friends and family to end the relationship. They were primarily concerned with Zemlinsky's lack of an international reputation and by an unappealing physical appearance. She broke off the relationship with Zemlinsky and subsequently married Gustav Mahler in 1902. Zemlinsky married Ida Guttmann in 1907, but the marriage was an unhappy one. Following Ida's death in 1929, Zemlinsky married Luise Sachsel in 1930, a woman twenty-nine years his junior, and to whom he had given singing lessons since 1914. This was a much happier relationship, lasting until Zemlinsky's death. In 1906 Zemlinsky was appointed first Kapellmeister of the new Vienna Volksoper. From 1911 to 1927, he was conductor at Deutsches Landestheater in Prague, premiering Sch?nberg's Erwartung in 1924. Zemlinsky then moved to Berlin, where he taught and worked under Otto Klemperer as a conductor at the Kroll Opera. With the rise of the Nazi Party, he fled to Vienna in 1933, where he held no official post, instead concentrating on composing and making the occasional appearance as guest conductor. In 1938 he moved to the United States and settled in New York City. While fellow ?migr? Sch?nberg was celebrated and feted in the Los Angeles of the 1930s and 40s - teaching at UCLA and USC and gaining a new generation of acolytes - Zemlinsky was neglected and virtually unknown in this country. He fell ill, suffering a series of strokes, and ceased composing. Zemlinsky died in Larchmont, New York of pneumonia. 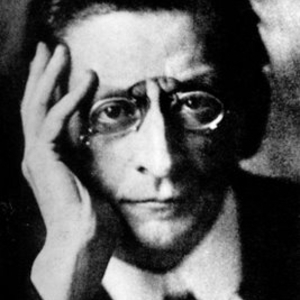 Zemlinsky's best known work is Lyric Symphony (1923), a seven movement piece for orchestra, soprano, and baritone, set to poems by the Bengali poet Rabindranath Tagore (in German translation), which Zemlinsky compared in a letter to his publisher to Mahler's Das Lied von der Erde. The work influenced Alban Berg's Lyric Suite, which quotes it and is dedicated to Zemlinsky. Other orchestral works include the symphonic poem Die Seejungfrau (The Mermaid), premiered in the same 1905 concert in Vienna as Sch?nberg's Pell?as et Melisande. A three-movement 1934 Sinfonietta, admired by Sch?nberg, was written in a style comparable to its fellow contemporary symphonic works by Paul Hindemith, Kurt Weill, and Dmitri Shostakovich. Other works include: chamber music (e.g. four string quartets), operas (e.g. Eine Florentinische Trag?die (1915-16) after Oscar Wilde), and the ballet Der Triumph der Zeit (1901). The influence of Brahms is evoked in Zemlinsky's early works (the ones that prompted encouragement from Brahms himself), while later works adopted the kind of extended harmonies that Richard Wagner had employed, drawing influence also from Mahler. In contrast to his friend Sch?nberg, he never wrote atonal music, and never used the twelve-tone technique. As a conductor, Zemlinsky was admired by Kurt Weill and Igor Stravinsky - not only for his notable performances of Wolfgang Amadeus Mozart - but also for his performances of contemporary music.